Have you reached a plateau in your roping? 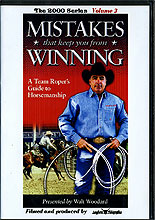 No matter what level you are, this DVD can help you reach new heights in performance for both you and your horse. With a focus on horsemanship as well as rope skills, Walt brings you through a stepwise program to bring you to consistent success.